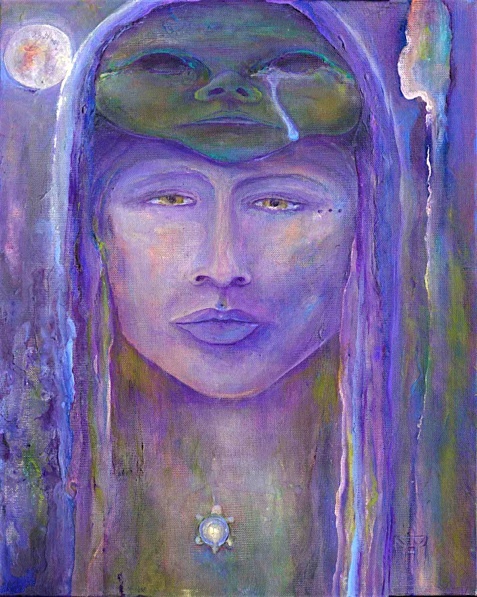 In the painting of “Warrior Unmasked” you see a Celtic warrior woman whose has been through the battlefields and seen a lot of pain, death and suffering. She has seen her brothers and sisters as well as her Motherland raped, therefore her raging tears burn for revenge. These wounds have found their way deep into her heart and out through her mind. Her mask when she is not fighting is held back tears, yet on the battlefield she passions her pain like a crown and fights for the honor that is hers to hold upright. It is time for her to let her mask down and cry her tears, feel the pain and let go once and for all. Perhaps it is time to give up the game of war, give up resistance and simply refuse to fight, as it only perpetuates more and more and the cycle never ends in this battlefield of rage. No need to rage in the war lore field any more. We have become warriors fighting the masked enemy called negative emotions. It’s time to call off the flaming arrows and welcome our enemy with open arms. What we resist persists. When we lay down our shield of protection and rejection and we look into this mirror the enemy’s eyes, we will see the other side of the shadow, a shining transformation and ally. Our flame throwing cycle of flying arrows and crossing swords is complete and ready to evolve. In the painting she wears the symbol of the turtle at her throat, Turtle can help lead us to that space where we can finally move on, to let go of what has been, celebrate it for the gifts it gave us and finally to turn and head for a new shore. Turtle people themselves often feel that their life is an endless series of endings and new beginnings. They are the protector of the Mother Earth. Originally this painting was a left handed self portrait, done with intention to connect to a deeper level of myself and in using my less used hand it made it all the more interesting in her enfoldment. One of the ways I have learned to transform anger for myself is to play my didgeridoo. This transformation happened one morning while playing, I witnessed my painting shape shift revealing a mask above her crown. Therefore I got back to painting and this is how she’s landed… off the battlefield, surrendered and ready to deal. A frown, like a thorny crown. Others claim no soul lies lame. The only way out, was through. She’s found Love... Trust the Goddess is here. Carry forth the Faery Faith out of Celtic hearts and Countries in recognition of the Celtic spirit. Carry it forward into a modern Celtic spirit by having a general love and reverence for the earth and Her creatures. Honouring self is honouring the Earth. Grief is not forever, it may feel like it when we try and deny the feeling and keep it under its numb layer of protection/denial, but when we step consciously and fully into the process of grieving then the experience can shift, release and integrate. Allow for appreciation of its gifts, then, blooming can take place as we move on from a stronger more beautiful place within. Rarely does it occur for us to drop the role of the warrior, to cease the battle all together. Perhaps we weren’t cut out to be soldiers in battle fighting against life. We have but to stand in a grove of trees or listen to the rush of a faerie fern-circled waterfall to feel the weight of our spiritual and emotional wounds begin to lift from our shoulders. When we delight in the color and scent of blooming flowers, pungent pine and cedar forests, we can lay our shields down and recognize the healing power of the Goddess is alive and present. In our cup of honeyed tea, she resides. She dwells in forest and field and sunrise, and for those of us living in cities, she dwells in the potted herbs of garden shops, the apartment window box, and the persistent yellow dandelion pushing out of a crack in the sidewalk.